A note from Darlene: Every once in a while, I like having Paul write a review for me. This time instead of doing a write-up on fast food, I had him write about one of his favorite foods: lobster. One of the downsides to San Diego is the geographic location — Maine is farther away than any other state except for Hawaii. My first lobster roll was in Bangor, Maine— a few miles from Stephen King’s home. That remains the “type specimen” of what a lobster roll should look and taste like. 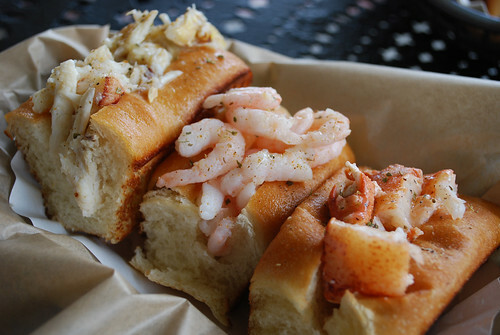 I’ve resigned myself to believing it’s impossible to get an authentic Maine lobster roll here in San Diego. To my surprise and delight, I found the lobster rolls served at Lobster West in Encinitas are prepared exactly as that first one I had in Maine. A Maine lobster roll starts with a thick slice of toasted bread— split along its crust to resemble a hot dog bun. The pocket should be buttered and dressed with some mayo. Within that pocket should be nothing more than buttery lobster lightly seasoned. If your lobster roll is crammed with celery and onions and other fillers, it’s not only wrong but a cheat. Lobster West is sort of the In-n-Out Burger of seafood: their limited menu is pretty much lobster, crab, shrimp, soup and salad. They also have some sides and serve whoopie pies and ice cream/gelato for dessert. The lobster comes from Maine and the bread and vegetables are local. Lobster West serves their rolls two ways: Maine-style (cold lobster and slightly pink in appearance) and Connecticut-style (warm lobster that’s almost bright red when served). You may have a preference, but I do not. Both were excellent and loaded with chunks of lobster which was lightly seasoned with dried thyme. I savored every bite. A combo comes with housemade cole slaw and chips for $15.95, but you can order just the roll for three dollars less. There’s even an option for more meat for a few dollars more (the mind reels, since the regular roll does not skimp on the lobster). 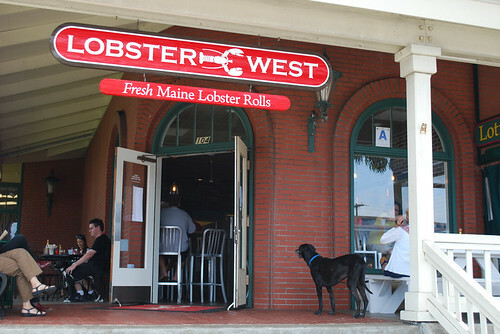 Lobster West also has crab rolls and shrimp rolls. If you’re having a hard time deciding, order the Maine Event Combo, which gives you half rolls of lobster (your choice of Maine- or Connecticut-style), Dungeness and blue crab and Maine shrimp for $20.95 (a la carte is three dollars less). 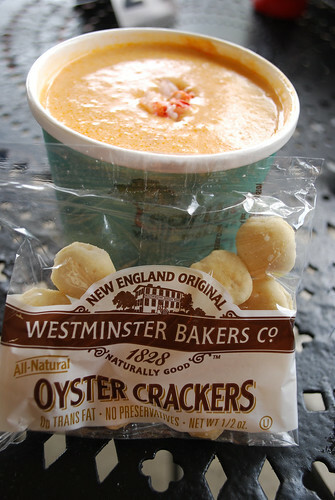 If there’s one thing I’m a sucker for, it’s a good seafood stew (bisque, chowder, seafood newberg, etc.). Their lobster bisque did not disappoint. It was creamy and perfectly seasoned; the sherry was noticable from the first spoonful. It wasn’t too runny or too thick, and the lobster was plentiful. A cup is $5.50, a bowl is $8. On my next visit I’ll try the clam chowder or the Maryland crab soup. If I had to be critical of one part of my experience, it would be their lack of seating. But that’s no reflection on the food. Hours of food service is limited; they are closed a few hours between lunch and dinner. Lobster West comes highly recommended; it’s quickly become one of my favorite area restaurants. Encinitas may be a bit out-of-the-way from where you live, but I’m sure it’s closer than Maine. This style of bun is my favorite. The lobster looks yummy! 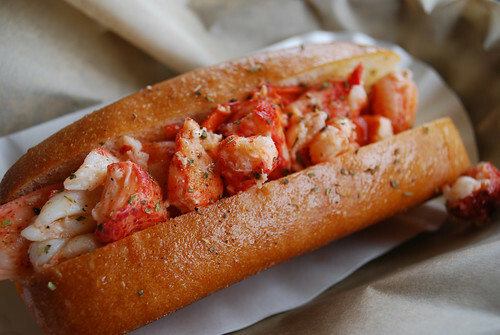 I’ve only ever had cold lobster rolls, I’d be interested in trying the Connecticut style. A nice benefit of a new england style bun is that you can toast them evenly on the outside. Nice post. I never even knew there were different types of lobster rolls. Both sound pretty good to me though. One day me and the fan will have have to venture north of the 8 (haha)…to experience the “In-n-Out’ of Seafood. Humminah…that Main Event Combo is what I’d want! “A Maine lobster roll starts with a thick slice of toasted bread— split along its crust to resemble a hot dog bun.” 😉 This is a New England Hot Dog Bun. I have a friend who has spent his entire life in the Boston area and had no idea any other kind of hot dog bun existed! You can actually buy a pan to make said buns if you’re really ambitious.